Editor’s Note: Ryan Leech is a highly-regarded trials rider and cycling coach. I have always been scared of jumps. They’re so mysteriously taunting. Anytime I try jumping it goes something like this: Whoa this is awesome! Crash! What the heck went wrong?! So I decided to avoid them as a rule. After all I had trials shows to perform and it would be irresponsible to sponsors and event organizers if I injured myself doing something other than what I specialized in. And thus my jump head games became strongly established. 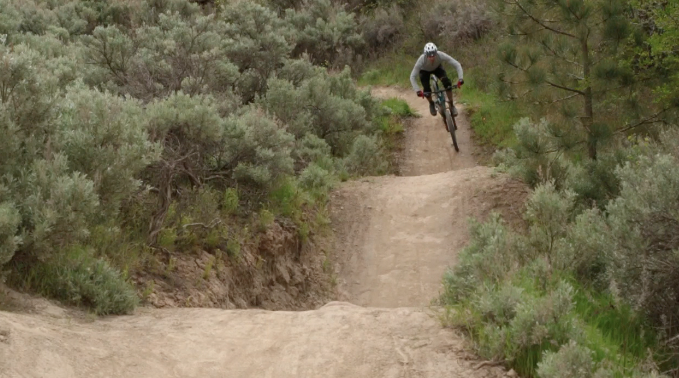 Meanwhile, all the talented trail builders were busy designing flow trails with berms and table top jumps. Over the course of my 20-year pro career they slowly began popping up on trails everywhere. Out of the 57,000 intermediate or easier trails listed on Trailforks, a significant chunk have jumps, especially the newer ones. The need for confident jumping skills these days just can’t be avoided. It now seems riskier not having jumping skills than it is to take the plunge and learn how to do it properly. For me, my skills in almost every other aspect of the sport are at the high end, while jumping hasn’t even registered on the scale. If I’m speeding through a fun trail, cleaning and flowing technical sections and then a sudden a jump appears, I always needed to hit the brakes or find an alternate line. I began growing tired of this. Are crashes mandatory in order to learn how to jump confidently? The greatest untapped fun potential in my riding lay dormant in all these beautifully crafted jumps, so I became determined to learn. But it needed to be in a way that radically reduced the risk of crashing during the process. I knew many other riders were in my position too, so I decided to document the process and create an in-depth jumping curriculum for my coaching website. Equipped with this compelling purpose, I reached out to who I thought were the best jumping technique coaches and got started. I had many conversations with park builder Jay Hoots about the idea, and also reached out to Shaums March, the head of IMBA’s Instructor Certification Program. I spent time with him both theorizing and sessioning at the jump park. I worked with Kat Sweet on unique trail situations where different types of jumps can pop up, and I knew many riders on my website would like some lift-served bike park tips, so Thomas Vanderham stepped up for that challenge. Sure we can all catch air. But can we land?! Well the best theory and jump drills are powerless without some practice structure and ethic. Additionally, there are some very mysterious aspects of the jump technique that just can’t be taught. It’s a “feel” thing, and if that feel isn’t developed deeply as a foundation, disaster can strike. Personally, I put in about two dedicated practices a week (about 30 minutes each) and kept that up for a few months. 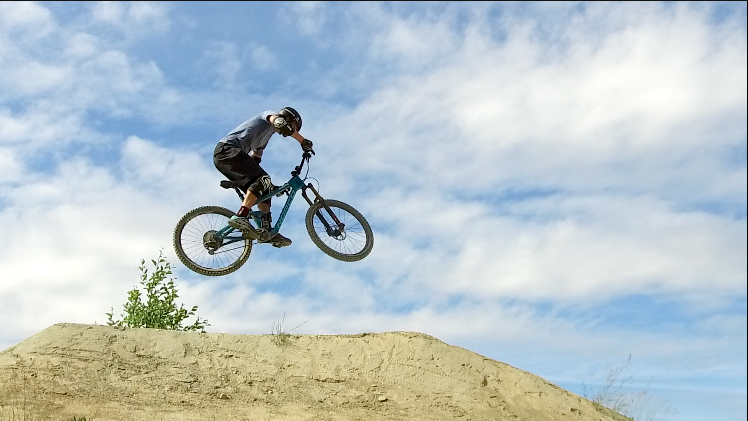 I also had jumps on my mind during my trail rides. I still have more to learn, but my confidence has grown to the point where I can say I’m in charge of my jump attempts not the other way around. That’s a good feeling. One of the most valuable tools I came up with to support my practice sessions was to focus on a specific teaching from one of the course coaches for at least 101 attempts. This proved incredibly motivating so I built it into the course curriculum. Practice quantity and quality on small table top jumps. I had many breakthroughs and insights, though two stand out. One was on my take off technique. I always hit jumps too fast and didn’t utilize a good stomp technique. Stomp is a term that coach Shaums uses to describe the loading process on the take-off transition. Due to the excess speed I carried it meant I had to avoid stomping otherwise I’d overshoot the landing from too much pop. The second was my landing technique. 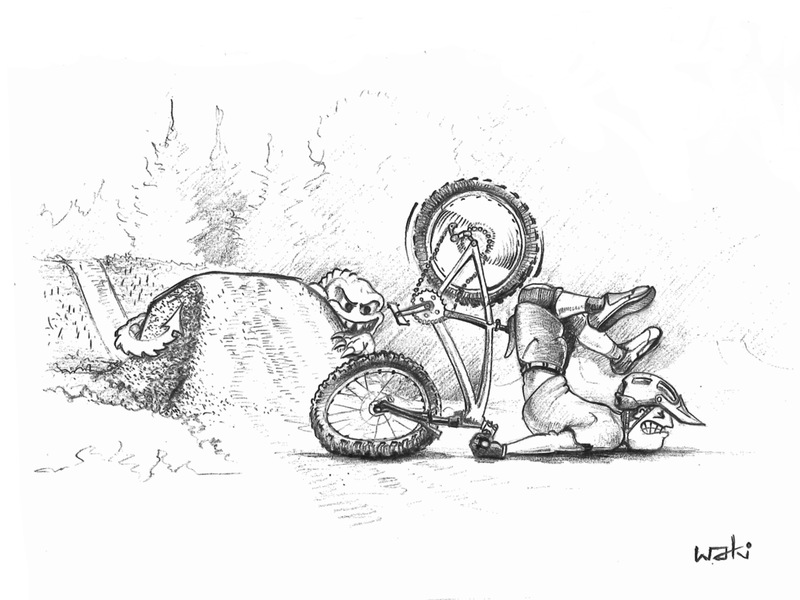 I always reached for the landing by extending my bike forward which led to many bad side effects (pun intended), including being unbalanced in the air and on the landing. With a more authoritative stomp and not feeling the need to hit the landing on every attempt it allowed me to become comfortable learning the correct bike/body angle needed for a solid landing. 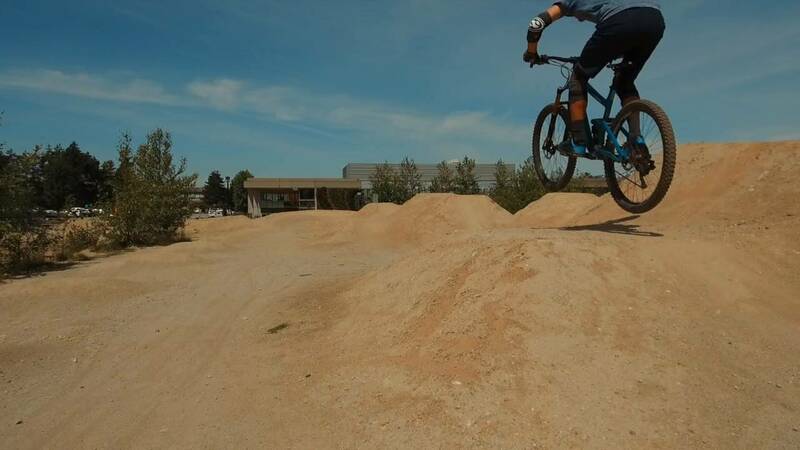 Practice on smaller jumps for longer than you think before being tempted to increase your practice jump size. I also made a resolution to practice on smaller jumps for longer than perhaps necessary, and to cap my jump size at the intermediate level even when they became comfortable. This was based on some clear goal setting, which I believe is one of the most important aspects of learning a new skill. How big do you want/need to go? 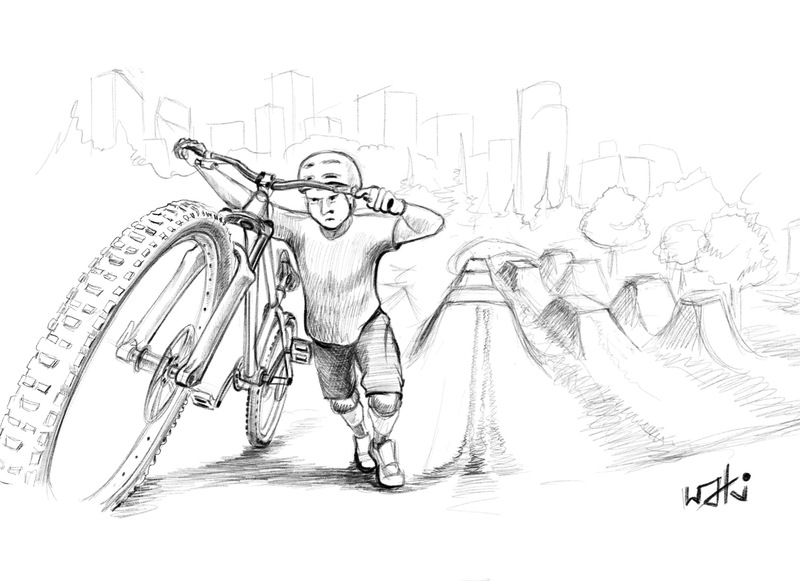 The sneaky and challenging thing is that this somewhat conservative approach to acquiring confidence with jumping often goes against our natural urge as mountain bikers to seek adrenaline. We love a good rush, and if we have even the smallest success on a basic jump, we immediately want to hit a larger one. What a trap! I knew this was the case having been through the process earlier in my career. So I had to deal with the mental fitness aspects of progression and modulate my urge to go bigger with my greater goal of being able to ride my mountain bike as injury free as possible late into my life. What have been your experiences learning how to jump? 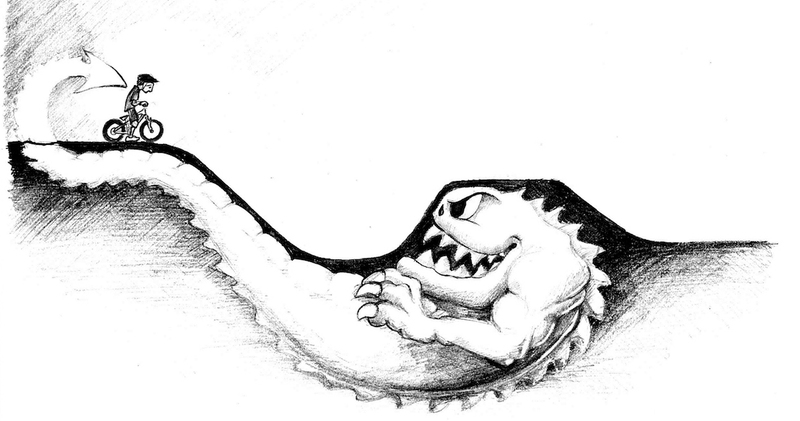 Smooth sailing or turbulent? If you are interested in learning how to jump or improving your skills, visit www.ryanleech.com. Ryan’s website offers comprehensive online training courses on a variety of topics, including bunny hops, manuals, and jumping of course. Sure we can all catch air – but can we land? !